Manager in a Minute, possible!!! Andrew Grove, CEO of Intel states “Just as you would not permit a fellow employee to steal a piece of office equipment, you shouldn’t let anyone walk away with the time of his fellow managers.” A manager’s job has always been considered a very hard job which is time taking and attention demanding to accomplish but this book claims it can be done in and around 1 minute. 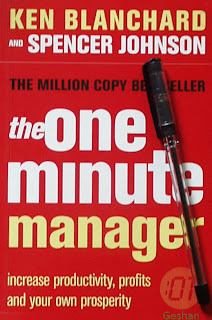 The book is titled the one minute manager and it states to have the trademark of: 01 symbol as seen in the cover. The book is inked by Ken Blanchard and Spencer Johnson. Blanchard is the president of Blanchard training and development Inc (BTD). Dr. John Spencer is the chairman of Candle Communications Corporations. There remains no doubt that the dynamic duo is incapable of writing a book on management. It is well justified as the cover depicts that it is more than a million copy bestseller. The book I got to read was the 27th impression of 2005; it was first published in 1992 by HaperCollins Publisher which has a long list of publishing houses spread round the globe. Technically the book has 16 chapters, the cover is not that eye catching but simple and to the point. The paper quality is good for the price of Rs. 1 hundred and twenty five but printing of negligible no. of characters is unreadable in few pages. The writers have fully attained the objective for writing this book and the message is loud and clear when the reader reaches towards the end of the book. This book primarily focuses on the base- A good manager is a man who isn’t worried about his own career but rather the careers of those who work for him. My advice: Don’t worry about yourself. Take care of those who work for you and you’ll float to greatness on their achievements: H.S.M. Burns, President of Shell Oil. This book kicks off with a young man in search of well balanced manager who can balance between autocratic results as well as democracy amongst the people he leads. The young man is initially unable to find any manager who can strike the correct balance between results and people, but he comes across the one minute manager. This book totally centers in what way does the young man gets to know and learn the one minute management skills from the one minute manager. The use of words like fire away, plaque, probe etc gives the reader a sense of being part of the conversation. The language is relatively simple and full page main points portrayed at consistent intervals are formidable. The highlighting of important messages in italic font is also noticeable. Reading this book feels like going through a conversational journey but you are supplemented with the ‘one minute’ managerial skills mainly comprising of one minute goal setting, one minute praising and one minute reprimand. The characters of Mr. Ternell, Ms Metcalfe, Ms. Jones and Mr. Brown all add to create a realistic office environment. The book should be read by all managers and want to be managers to know how to simplify their complex work life. The book is precisely practical and methods mentioned by the writer duo can be instantly implemented. It in the beginning tells the three magical secrets of one minute management as mentioned in above paragraph and in the latter pages describes how do these three magical secrets come into effect. The examples given by the so termed ‘one minute manager’ are very pragmatic and logical. Comparison of a pigeon and person may not seem rational here but it goes in sync with the text in the book. The use of adjectives and action verbs is not done in a miserly fashion. The recap flowchart presented in page no. 101 is the real summary of the whole book. The end with the women factor involved makes the book even diplomatically correct. All in all this is a must have book for all managers and willing to be managers. Read through the 1 hundred and eleven pages of this book will be a very good time utilization of the reader. Personally I would even want to read the other titles by the writer duo. Finally this is a must buy book that will increase the value of the management section of your book shelf.